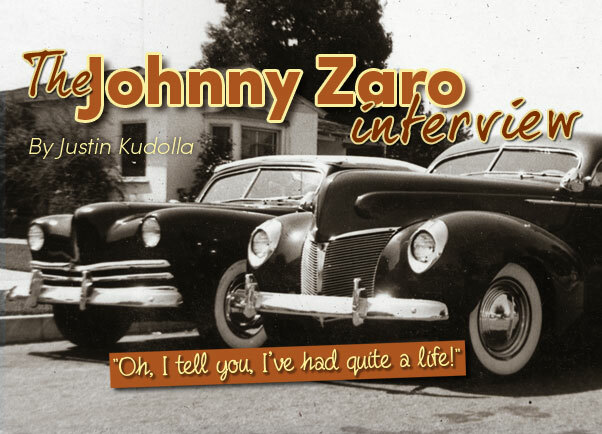 In 2006 Justin Kudolla sat down with the late Johnny Zaro and his wife Fay in their home in Murrieta, California. 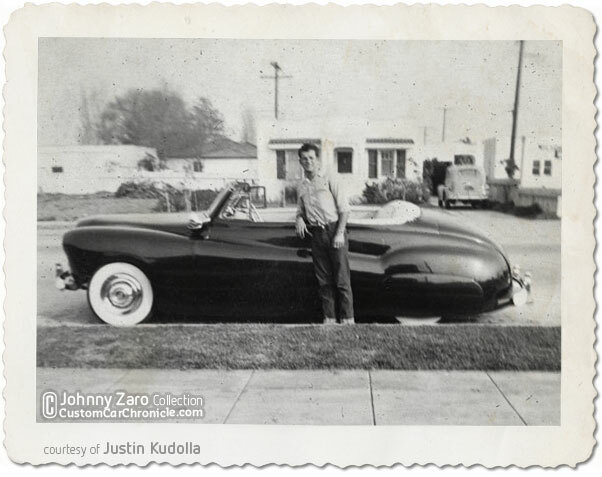 Justin talked with Johnny about his Custom Car years in the late 1940’s and early 1950’s. 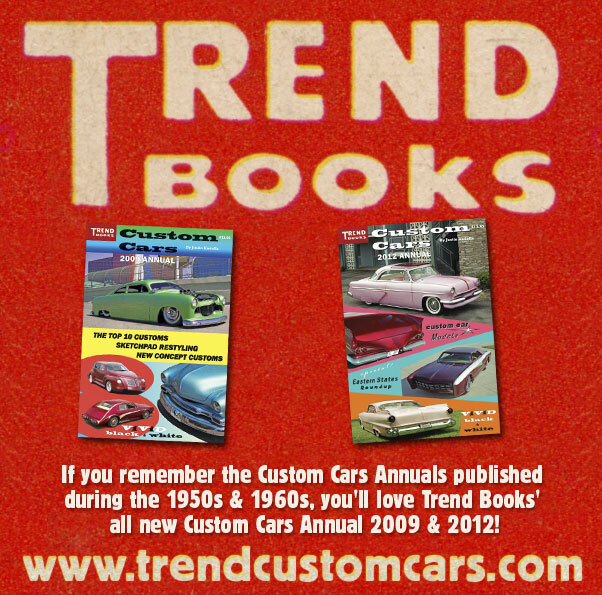 Justin Kudollo is editor of the Trend Books Custom Cars Annual. 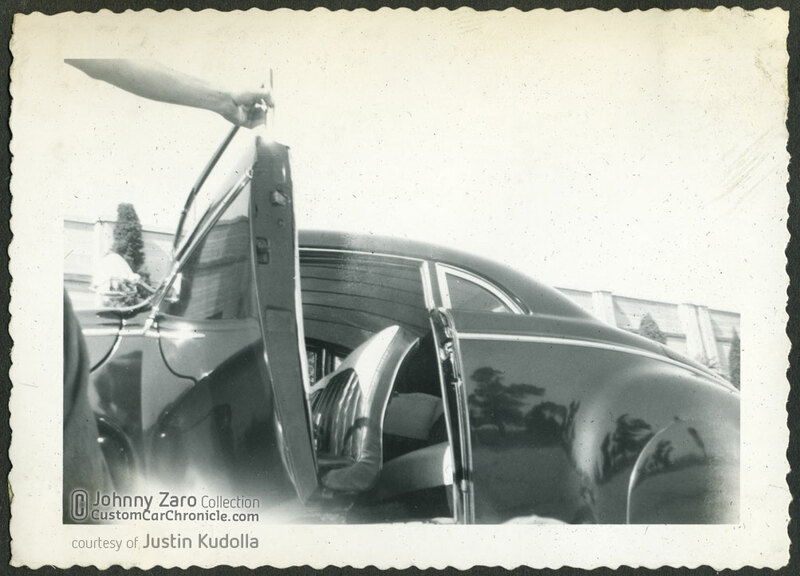 The interview with Johnny Zaro and the many scans he made from the Zaro photo album appeared in the Custom Cars 1012 Annual. The article here on the Custom Car Chronicle is a slightly revised version courtesy of Justin Kudolla. A few scans from the original article are shown here, but for the full experience we advice you to get a copy of Justin’s 2012 Custom Cars Annual. The Johnny Zaro article in this booklet alone is worth getting a copy. 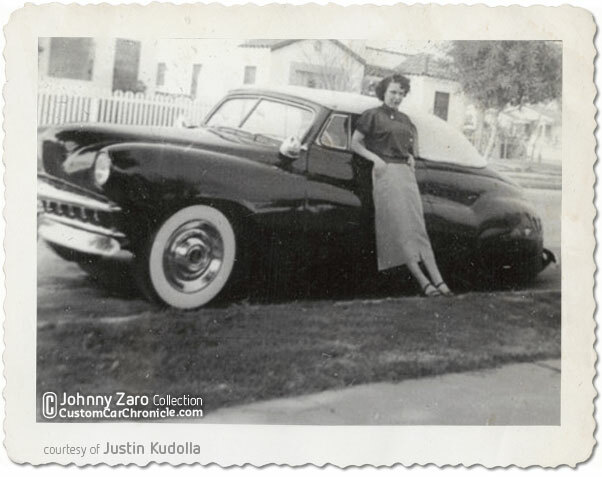 Then of Maywood, California, Johnny Zaro was an early custom car devotee. So early, in fact, that he was able to witness first hand the cars coming out of the Barris Brothers’ fledgling shop on Compton Avenue in Los Angeles. 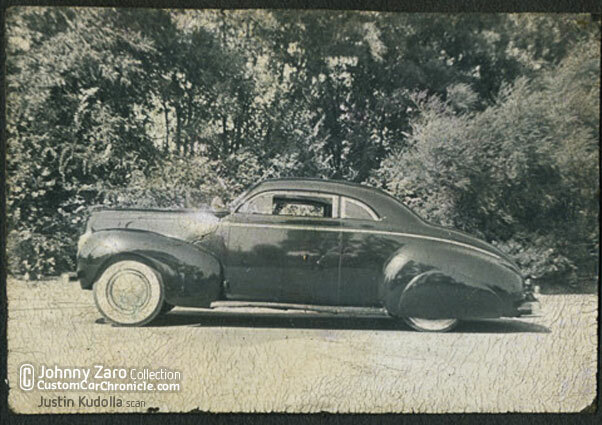 Zaro owned two Barris creations, a chopped ‘40 Mercury coupe that was a close match to one owned by his good friend Al Andril, and later, a ‘41 Ford convertible that was one of the wilder early Barris efforts. 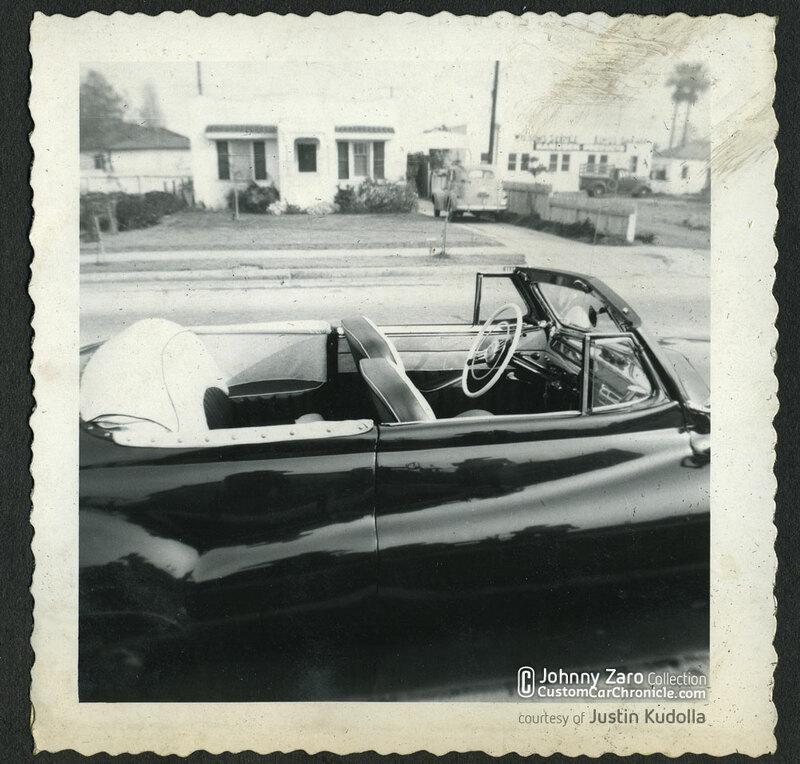 We spoke with Johnny and his wife Fay recently to get his views of the things he experienced during the early days of customizing in Los Angeles. Q: How did you find out about the Barris Brothers initially? Johnny Zaro: Al (Andril) must have found out something about them, I didn’t know where they were at. We were both down in San Pedro waiting to get discharged and he found the place up there then, so every time we had a chance, we’d get out and go up there and work on the cars. It was at nighttime a lot of times. We couldn’t get up there in the daytime. Sometimes George would be there until 12 or 1am, something like that, if he was spraying something. But as far as bodywork, he would get done at maybe 5 or 6 o’clock. And when I knew George, he was living in nothing but a garage with a dirt floor and a little bathroom in Huntington Park. And from there, he got a step up; he started living in Warren Breeland’s mother’s home over near the shop. Warren, he was going to UCLA. I don’t know where George lived when he had the shop in Bell. Q: What was their Bell shop like? JZ: The place sat way back off of Florence. They weren’t really there too long. It was probably about three blocks west of Atlantic on Florence. Q: What about the shop on Compton Avenue? JZ: It was in this old double garage. There used to be this fellow that lived right across the street from the shop by the name of Gordo, and he used to work for George doing body and fender work. But at the shop on Compton Ave., there were actually two places right there. The one next door, I can’t even think of the fella’s name, but he rented that to George. It was the fella who owned the property, he had a brake shop right on the corner. They put in one of the magazines that George had the brake shop and all of that, but he didn’t have anything to do with that. He just rented the one side out. Q: What was Sam Barris like? JZ: Sam’s the one that did my Merc, George is the one who did the Ford. Sam was a really nice fella, we got along real well, he and his wife were at our wedding. I piled the Merc up once, and I was still living at home. He was at the shop working late. I called him and said “I smashed my car up, and I haven’t gotten home yet..” He gave me a ride to my house at 4 in the morning. Yeah, he came in real great there. Then, George started coming into the picture more, and then him and I got close, and he would come by, and we’d go out and go all over; to Eagle Rock, Burbank. Then, I hadn’t seen George for about 30 years, and we went up to Paso Robles and were in a restaurant. I said to the wife, “Doesn’t that look like George way over there?” He was getting up to walk out, so I said, “I’m going out to see if that’s him. George was the type that always wanted to be a big shot, Mr. Important (laughs). So, I went out there and I said “Say, is your name George Barris?” He was talking to another fella right then. He said, “Yes, my name is George Barris.”I said “Oh, could I have your autograph?” He didn’t even recognize me (laughs). He says, “Who are you?” I said “I’m John Zaro.” He said, “Oh, you crazy so and so!” He runs and jumps up into my arms, I had to catch the guy! George was great, we got along real well. 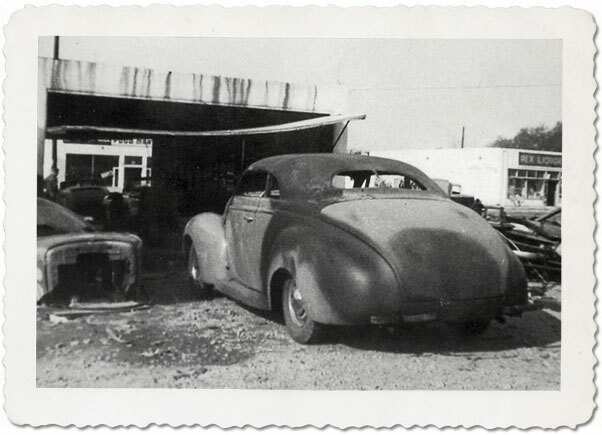 Johnny’s 1940 Mercury sitting behind the Barris shop Compton Avenue shop with most of the body work done. Q: Did you cruise the drive-in restaurants? JZ: Oh yeah, it seems like if it wasn’t with one bunch of the guys, it would be with another bunch. That, or we’d be at the Clock Drive-In and somebody would say, “So and so and so and so are going to race their cars,” and there used to be a place out on Slauson that guys would run these things through. Another place was at what they called “The Divide,” and the cops would come from both ends and you saw the red lights and the cars were driving off through the oil wells! Q: Where was the main Clock you hung out at? JZ: They had a few Clocks. They had one in Maywood, Bell, Huntington Park; the one in that was in Huntington Park was the most famous. It was one to two blocks south of Florence on Long Beach Blvd. on the right hand side. There also used to be a drive-in on Manchester Blvd, and they had a radio station there, and this fellow Carl Bailey, (he was a giant of a man) and he would get on his knees and stand just level with my car door to talk to us with his microphone. We thought that was great! 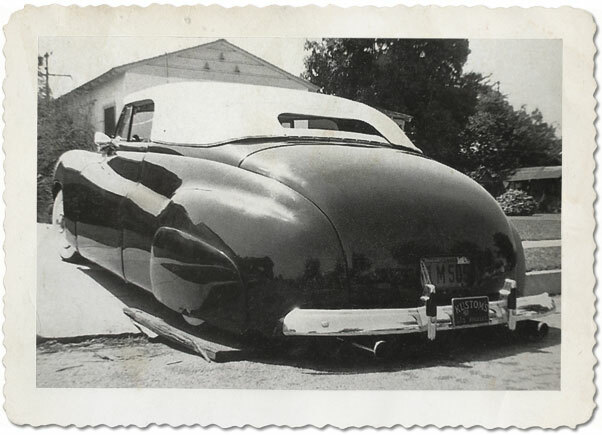 Johnny’s 1940 Mercury sat perfectly with the the right speed boat stance as this cracked side view photo shows. Q: Did they broadcast that over the air? JZ: Oh yeah, right from the drive-in. It was late at night, around 11 or 12 o’clock, something like that. We’d go in there and get a hamburger or a malt or something, and he’d be there and go around to different cars and talk to people. Usually, he’d stand up, but when he came to mine, it was so low that he’d just get on his knees and look right at us! 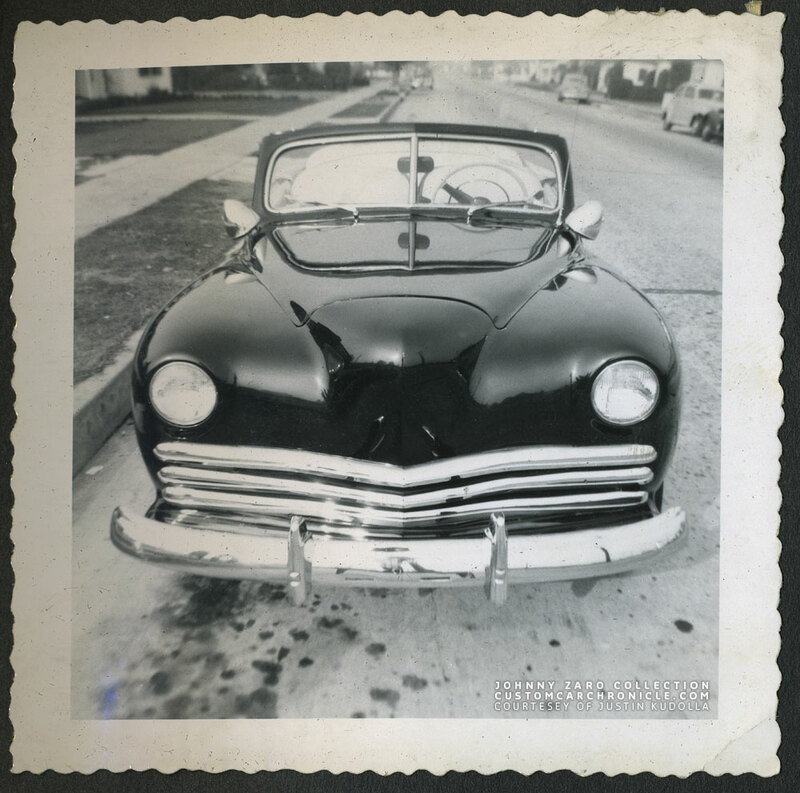 It (the 41 Ford convertible) was channeled, so the body was dropped over the frame instead of having it back up on top. Q: When did they tear the Clocks down? JZ: I don’t know. Once I got married, I really settled down and didn’t go out cruising. I was usually working on the house, or I had a real estate license and I was working on that. 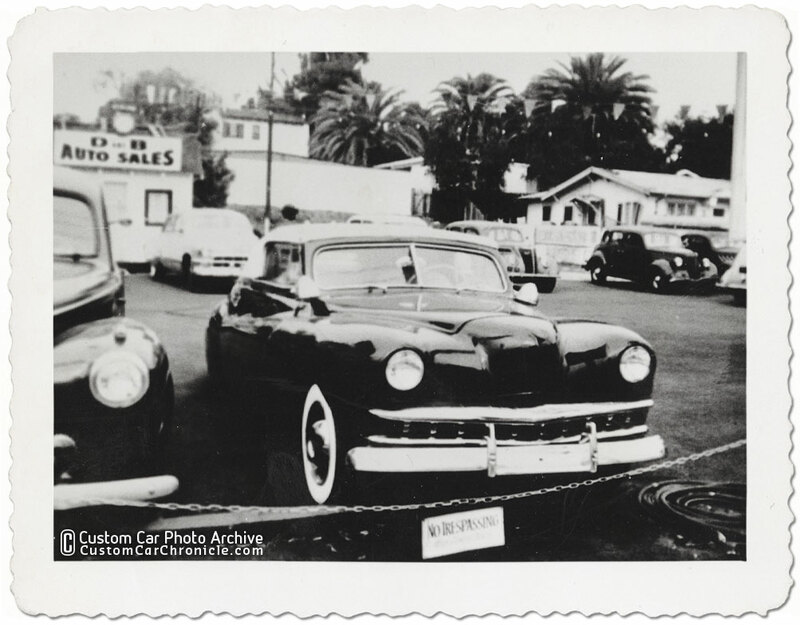 Although, at one time I did have a gas station that was just down the street from Barris’s shop in Lynwood. They’ve taken it out now, but it was a block or two south of his shop, and right across from a place called George’s Barbeque. I wasn’t making anything, so I got out of it. Q: Were your customs your everyday cars? JZ: No, I had an old junker of a car that I drove to work, it was a ‘35 Chevy. I even had a rope tying the door closed! I’d drive that back and forth to work because I didn’t want to take the convertible out in the daytime and get it messed up. I was very fussy about it, before it came out of the garage in the nighttime, I’d completely dust it off. 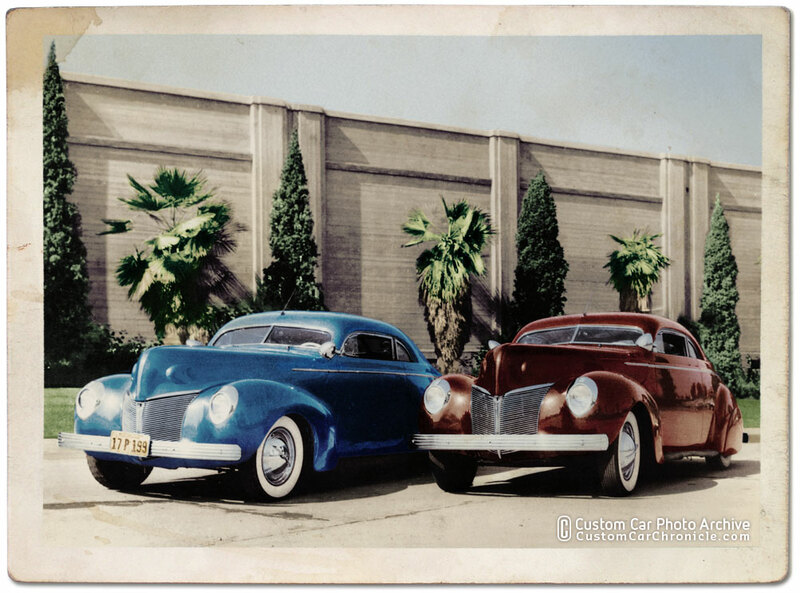 Colorized photo of the Al Andril (left) and Johnny Zaro nearly identical 1940 Mercury coupes. Q: How did you meet Al Andril? JZ: He lived across the street from me, we were good buddies. Al and I knew each other since we were 10 years old, He moved from San Francisco. We went in the Navy together, and when we got out, we decided we were going to get ‘40 Mercs and customize them. So we took them up to George and Sam’s shop and let them go ahead. Now, Al’s car they started on first. Mine was a bigger project, because when I was coming down Alameda, there was a car that pulled out right into the side of me. So they did Al’s first, and then it was no sooner than he got it finished that he got married. Q: Did you get a lot of attention driving around together in your matching custom Mercs? JZ: (Laughs) Yeah! I even had a lot of attention driving around alone in that car, and the Ford. Q: So, you had the Merc and the Ford at the same time? 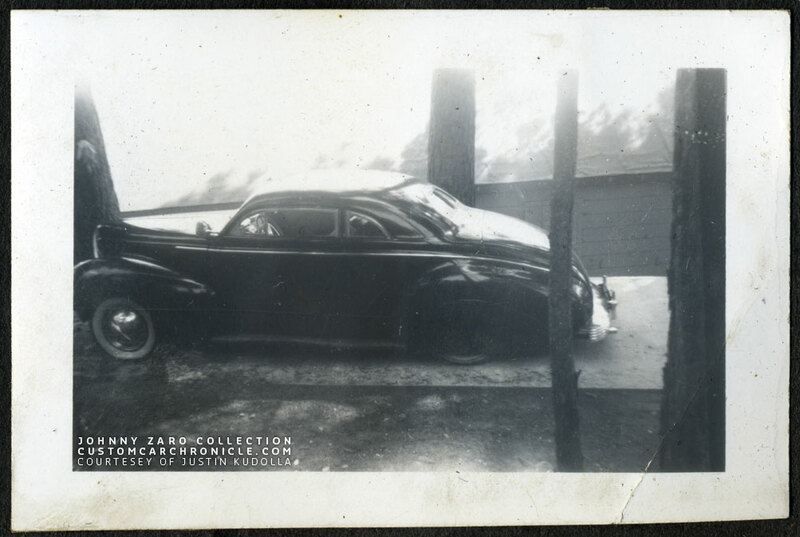 Q: Were there many custom cars around when you two started building your ‘40 Mercs? JZ: No, there really weren’t that many around at all when our cars were done. In fact, you didn’t see hardly any custom cars. Maybe they might be nosed and decked, but as far as being chopped and having push button doors and channeling, no you didn’t see that. 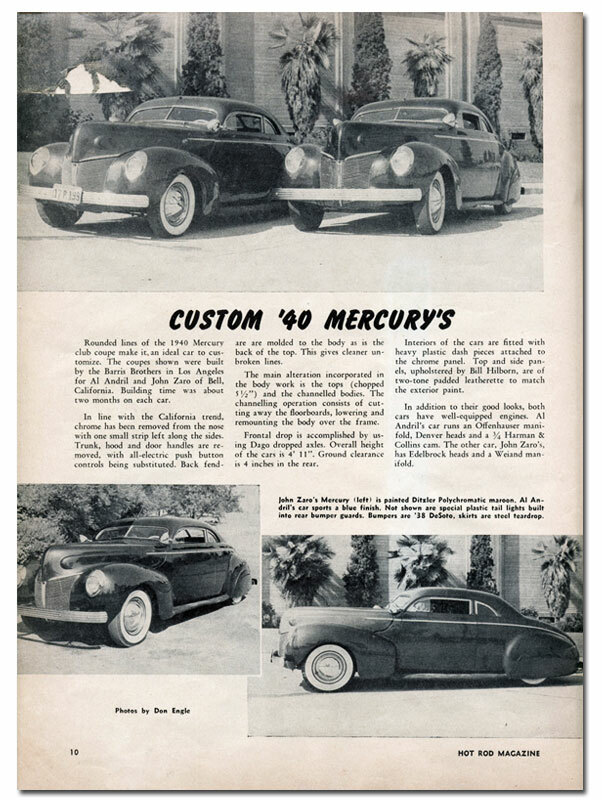 Hot Rod magazine article on Al and Johnny’s 1940 Mercury’s. Q: So yours were some of the first? JZ: Yeah, they were, (some of the first) to have a complete customizing. Q: How did the idea of using dual spotlights on customs get started? Q: Roughly how much money did you have in both of your cars? JZ: Gosh, I couldn’t tell you, to be honest with you. See, when you had George work on your car in those days, it wasn’t going to get done unless you got down there and worked on it too. So, I was still drawing my 52/20 from the Navy ($20 a week for 52 weeks), and we’d be down there every day working on the car so it would get finished. Most of it was easy work, like sanding or some little thing, they did all the major work, believe me. Q: How were you able to afford all of that custom bodywork? JZ: Well, I saved all I could when I was in the Navy. Then, when I went to get the convertible, I didn’t have enough money and I borrowed some from my mom; but she didn’t have enough, so we went over to Seaboard Finance Co. in Huntington Park, and I borrowed money from them. Johnny showing the new interior in his 1940 Mercury. This snapshot was taken during the photo shoot for Hot Rod Magazine. Johnny’s Merc parked in the driveway. Q: They loaned you money to build a custom ? JZ: Probably my mother took back a second mortgage on the home or something. Anyway, we got everything straightened out, but then I had some trouble making the payments to Seaboard and they came and took the car from me. I didn’t have any choice. They were supposed to put the car in storage down in Los Angeles, and charge me $20 a day for storage back then! So anyway, I found out the manager of Seaboard Finance Co. had the car over at his home in South Gate and he’d been driving around and raising heck. He smashed the bottom part of the fadeaway in, and I got it and took him to small claims court and the judge wouldn’t give me anything on it! 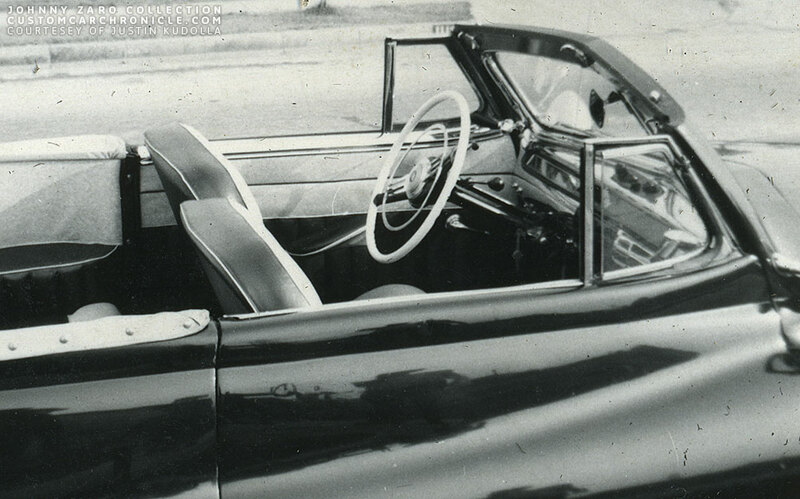 Q: Wasn’t there someone who owned the convertible before you? Q: Did your Ford have a Plymouth grill initially? JZ: That was just some bars we had in it, I don’t remember what they were from. The second grill was parts from a Pontiac and a Studebaker. 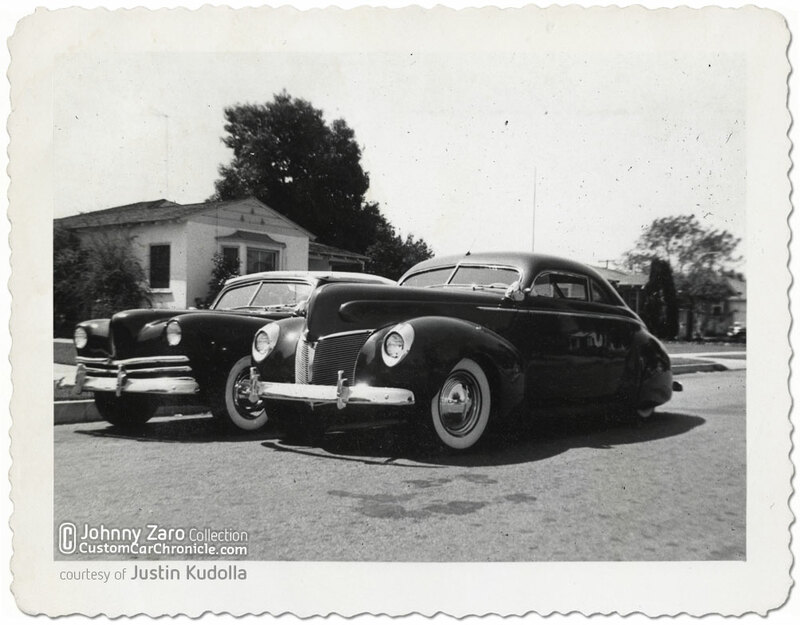 A great look at the first grille version on Johnny’s 1941 Ford. Notice the great work on the smoothed lines on the raised fenders, sectioned hood and new shortened hood front section. Q: What about the engine? JZ: In the beginning, I had a regular V-8 engine, but then it got a 3 and 5/16th bore, Weiand heads, a Spalding ignition, Howards cam, and an Edelbrock manifold. It was a full engine, that thing really went! Q: Which of your cars had gold dust in the paint? JZ: Both of them, it was called a Polychromatic Maroon. The paint was made by DuPont, and I remember that because I was down there when they were painting it, it was at nighttime. And Al’s car was blue. In one of the magazines, they got it down as green, but it wasn’t. It was the same color as Sam’s ‘40 Merc convertible. They had Sam’s down as green also, but it was blue. 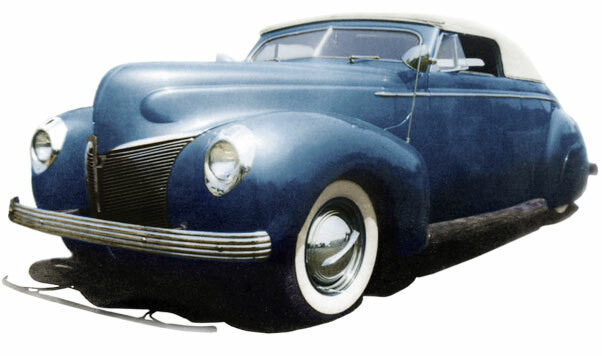 Sam Barris 1940 Mercury convertible, in blue. Q: What was the lighter color you had on the convertible? 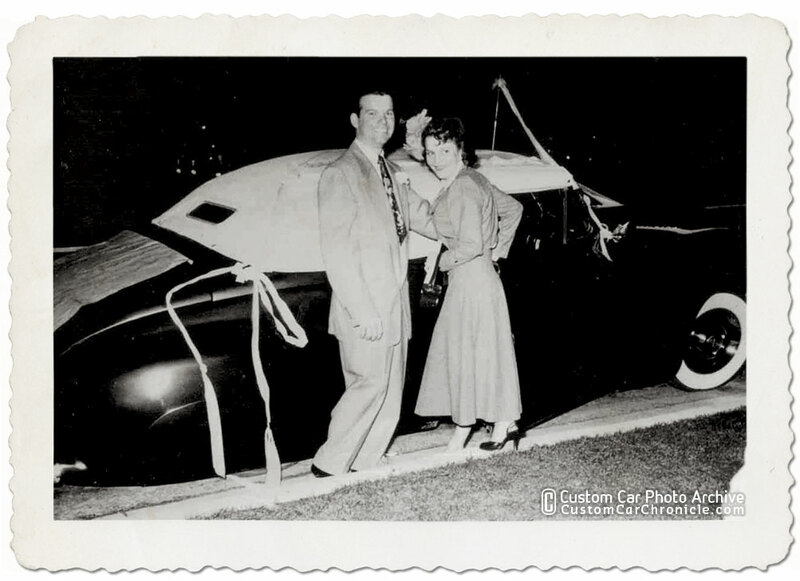 Fay and Johnny getting married and ready to drive away in the 1941 Ford. 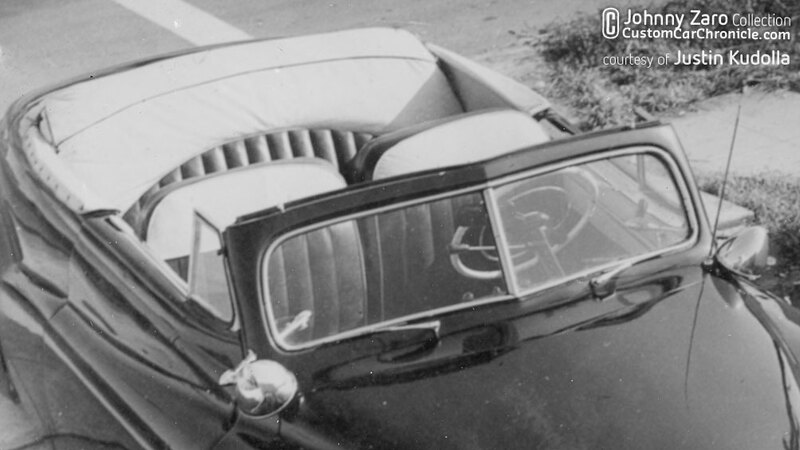 Q: Who did the top and upholstery in the convertible? JZ: The upholstery was by a guy in Inglewood. I think it was Bill Hilborn or something like that. I think Gaylord did the top. His shop was over on Atlantic in Bell at one time. I’ve known Gaylord since I was a young kid going to school, he knew our family and everything. Q: What about the rest of the interior? JZ: I had a special panel on the dashboard, made of plastic, kind of a wine color, or dark maroon. Q: How did you form that? JZ: We cut the plastic, ground it down, and polished it. We had screws coming into the back side. We did the same for the radio knobs and all of that. Underneath the dash, I had a wine colored light that came on when you opened the door. JZ: Pushbottons were on the inside on the driver’s side. I’d push the button and the door would open on the passenger’s side. Underneath the car, I had a button to open the doors from the outside, then I had a shut-off switch underneath the pan in the back where I could flip it like a toggle switch and it would shut the juice off and no one could open the doors. I also had a hydraulic lift in the hood and one in the trunk, and I’d pull the switch while the car was running, and it would raise on up and I’d take the cap off on the inside and put the gas in there. Q: That’s pretty high-tech for the early 1950s! FZ: They are the first ones that did all that. They were the granddads. (Laughs) That’s why he had so much trouble with it. JZ: I used to get plenty of tickets for it, because it was too low. I’d get tickets for the pipes on the car, oh, you name it. FZ: And cops would follow him, so he’d have to go down side streets or the alleys.He’d pick me up, and we’d go down all these alleys! I used to live right down there in Lynwood, on Duncan. I knew George from going by when I would go to work, and we’d say hi to one another. FZ: Yes, but i had to be in by 10 pm, my father was very strict. Q: What made you decide to sell the Ford? JZ: That’s what irritated me, (Laughs) because every girl always thought the car was great! Gee, it was beautiful, they wanted to be seen in it! I’d drive down the street, like on Pacific Blvd. in Huntington Park, and they’d start yelling “Johnny, Johnny!” And it wasn’t me, it was just the car! But still, I thought I was Mr. Big Deal! FZ: But when I first met him, he had the hood off. JZ: Yeah, I had just put a new engine in there. Cropped part of one of Johnny’s photos ives us a better look at the interior. The dash was chrome plated with custom made clear red plastic lucite parts replacing the factory plastic parts. Q: Tell us about the boards in your driveway. JZ: That’s what I had to do at home, I couldn’t go down or come up my driveway, because it (the convertible) would scrape too much in the back. The guys that cleaned the street, they would get very upset; they’d have to stop their street sweeper and throw my boards back up onto the lawn! And then I’d come home, put them back into the street, and drive on in! It was two pieces of wood with a board underneath nailed together. It was wide enough to run one wheel over it, I had to raise it up enough so I could go in without scraping. Johnny getting the car in an out of the drive way using boards to make sure the pipes and bumper would clear the pavement. Q: Did you have any casters under the bumper? JZ: No, we had never even thought of that in those days. But we still had a lot of fun with the car. One time George wanted to take my car up to the Oakland Roadster Show. I told him “No, not unless you put the car on a trailer and take it up there.” I didn’t want to put any miles on the engine, I just had a full engine put in the car. So, he ended up bringing a trailer and he took it up there, and then I flew up there and drove it back. Q: Tell us about your tribulations trying to sell the Ford. JZ: First, it had it up for sale on the D&B car lot, and it wasn’t there 24 hours, and it was stolen off of the lot. The FBI called me and told me they had my car down in Kingman, Arizona. It was a federal offense once the car got across the California border. So I went down there, and it was a couple of guys from Boston who stole the car, and they ruined the motor. My soon to be father-in-law took me down, and we towed it back from there. Then, I ended up putting another full engine in it. The 1941 Ford at the D & B Auto Sales lot. Q: What did you get for it when it finally sold? JZ: I don’t remember. I know the fella came out here from Lincoln, Nebraska. He was going to college back there, and I got a letter from him and he said he was able to take it to school there one day, and then, he said he couldn’t take it any more, because everybody was all over it! Even out here, when I’d park on Pacific Blvd. in Huntington Park, I could walk away from the car and come back in five minutes and people would be all around the car. A fella who had another real nice looking car was Jessie Lopez. 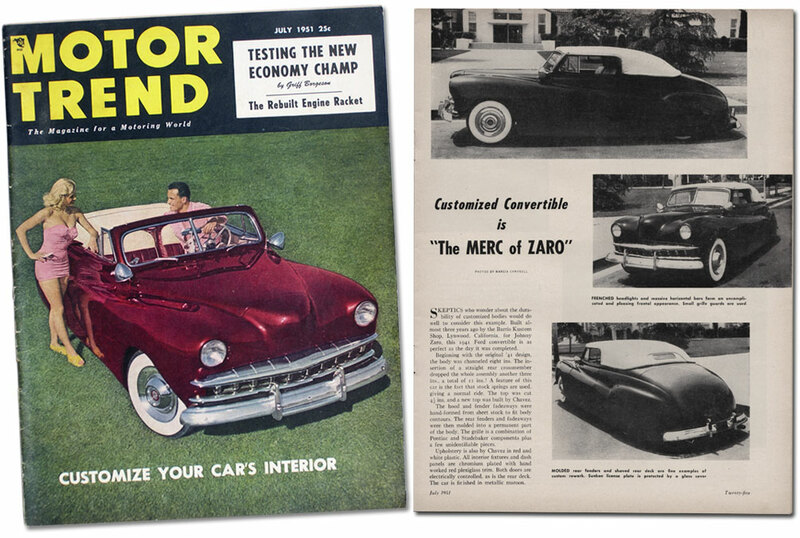 Q: Was that you sitting in the Ford when it was on the cover of Motor Trend? JZ: No it wasn’t. They wanted me to, but I didn’t feel that I could leave work. I wish I would have! George went ahead and took the car and had the picture taken. Q: Any other good stories with the ‘40 Merc? JZ: A girl I was going with, she was coming with me to pay this ticket in Pomona. I was coming down E. 19th St., and I was moving right along the curve and it went into an “S.” I came around real quick and didn’t make the turn all the way and here come these big huge trees. I flew over this drainage ditch in the Merc and hit it just even on each side and just barely creased the fenders on both sides! Then, the girl knew somebody that was coming up the road with this big dump truck, and he pulled us out. Q: That sounds like something from a Bugs Bunny cartoon! JZ: It messed the car up pretty bad, I had it fixed up in San Bernadino. Oh, I tell you, I’ve had quite a life! 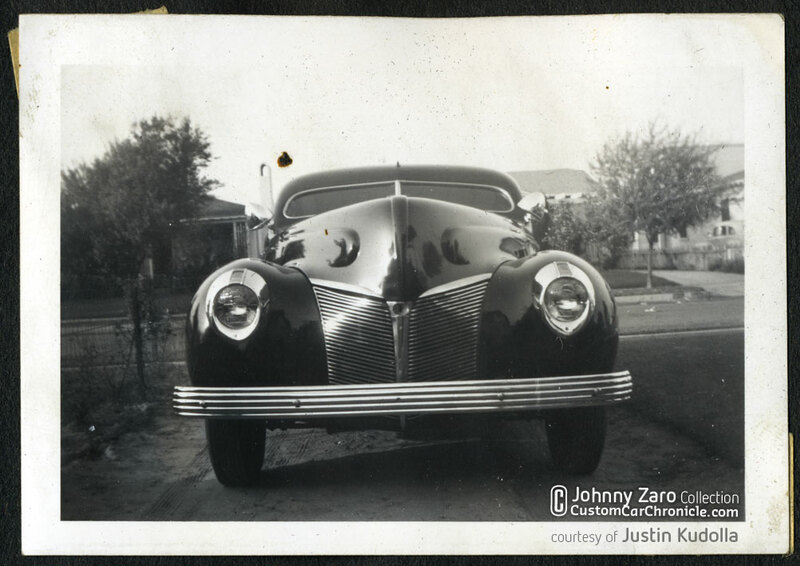 The photos in this article come from the Johnny Zaro Collection, courtesy of Justin Kudoll, and the Custom Car Photo Archive. 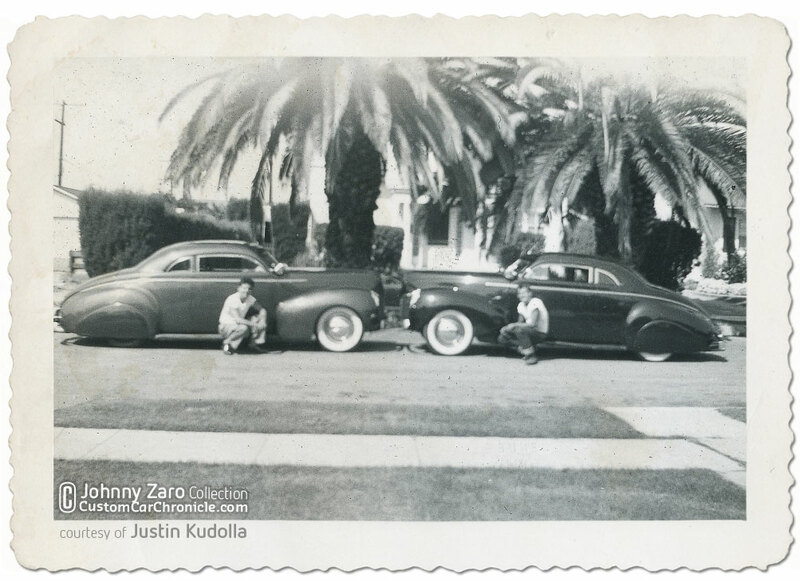 If you want to see more of the amazing Johnny Zaro photo album order a copy of the 2012 Custom Cars Annual from Justin Kudolla’s Trend Books. Use the ad below to find your way to their website where you can order the book. 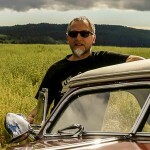 The is an excellent, very cool read on Johnny and his cars. This story just reminds me of so many things in the day and how it’s so great to have the cars we love back in the lime light. Thanks for the comments Wayne, I’m glad that you enjoyed it!